This was our second stay at Maria’s gorgeous apartment. Our room was bright and cosy with a comfortable bed and lovely en-suite. We loved the views too. Maria is a wonderful host and made us feel very comfortable in her beautiful home. Maria welcomed us warmly into her stylish home and our room with ensuite bathroom was just perfect - bright and airy but cosy too with underfloor heating. Maria left us to be very independent but was there when we needed her and we enjoyed chatting with her too. Many thanks Shirley and John for choosing to stay in my place. Knowing people like you is a real pleasure! Your beautiful energy, your kindness and discretion, your communication made me feel like I had friends at home. I wish you a nice return home and to your life and best wishes for the next happy event. Thank you again for your kindly revew! You are always welcome. 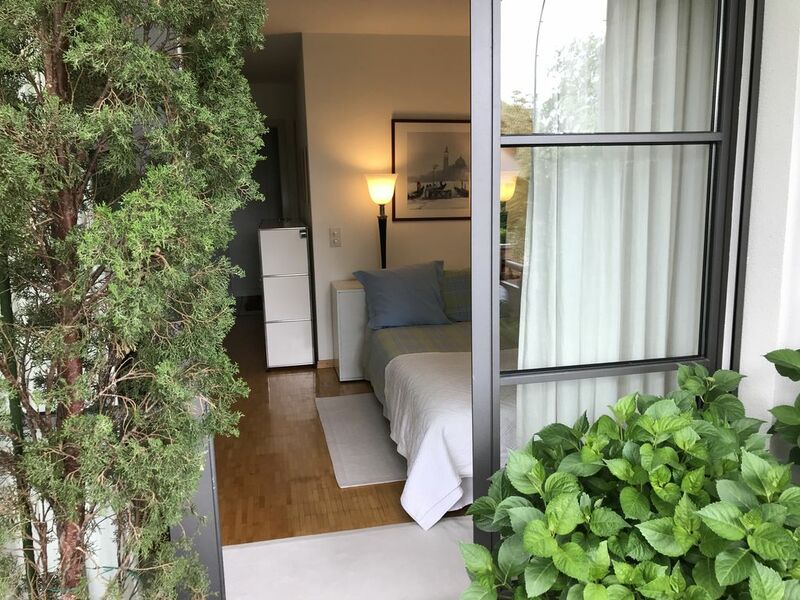 Beautiful private room and bathroom in Nyon! Maria Luisa was the best! She is so sweet and gave us a perfect balance of independence and talking with her. She gave great recommendations of things to do around Nyon! The room was very clean and the balcony was beautiful! The location was a quick easy walk to the center of Nyon. Maria Luisa even left us some water and chocolates for our stay. She knew we were leaving Nyon for Florence and even gave us a Florence book of things to check out while in Italy. She went above and beyond as a host- I would highly recommend staying here! Jessica and Jaret are a young copy, very nice, independent, polite and with a positive energy. I hosted them for five days and they were so quiet and discreet that I hardly noticed them. They brought me an air of youthfulness and joy, always very positive and careful not to disturb. What a nice meeting! I wish them so much happiness and success for the new life that they will have starting together. Thank you Jessica and Jaret! We had a most perfect stay with Maria Luisa in her beautiful home. The room was clean and comfortable for us. She provided the perfect balance of hosting and privacy for us as well as delicious breakfast and coffee in the morning. We enjoyed 2 nights and some wonderful conversations as well. Maria' Luisa's home is perfectly located within walking distance of the lake and the old city and chateau. And if you drive there is a perking spot right in front of her house! Enjoy! Thank you Mary and Jay, It was a pleasure to meet you! I hope to see you soon! I had a lovely time staying here..... I only had one night to stay though I wished to stay longer....Maria is a lovely warm host that made me feel right at home..... I do hope to return soon. It was extremely pleasant to receive Nathan at home. I had a good felling with him also if we could't exchange too much because he had to leave the place one day before. Nathan is very polite and quiet, he is always welcome if he choose to come again in the future. We really enjoyed our stay in Nyon. Our host was very welcoming, pleasant and helpful. The apartment was well furnished and a good location for accessing the beach and restaurants. We enjoyed staying in Nyon but still being able to see all the sites in Geneva. I’d highly recommend this property.